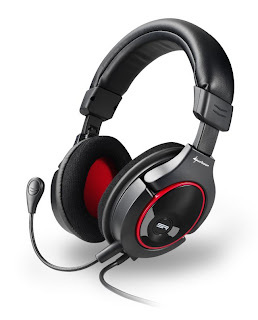 Sharkoon presents the newest model to their successful X-Tatic headset series: The Sharkoon X-Tatic SR offers, through Dolby Headphone Technology, realistic Surround Sound on the Xbox, Xbox 360 and Playstation 3 gaming consoles, to include PC, Notebook and other audio sources. The integrated Dolby Headphone Technology transforms "Dolby Digital 5.1" signals and, in conjunction with "Dolby Pro Logic II" Decoders, "Dolby Digital 2.0" signals into 5.1 speaker sound for stereo headphones. Thanks to authentic sounding localization while gaming, the player can approach their virtual opponents from all directions. High-quality 40mm speakers contribute to an intensive sound experience. The extensive cable kit, including the Sound Control Unit equipped with analog and digital audio input, allows for a wide-array of connections and sound options. For gaming and music, two different modes are available with each selection containing different tones and effects. The gaming mode places the focus on rich, smooth bass sound, so that particular gaming effects are accurately reproduced. The music mode provides a balanced sound. Those who prefer listening to music with a classic stereo sound can easily turnoff the Dolby Headphone feature. A second headset can be attached via the 3.5mm audio jack on the controller box to include another to the listening pleasure. Power is supplied to the Sharkoon X-Tatic SR from the Xbox, Xbox 360, Playstation 3, PC or Notebook via USB. With an optional USB power adapter the headset can also connect, via the 3.5mm stereo jack, to other audio sources, such as MP3/MVP-Player, DVD Players, smart phones, or Tablet PCs. The microphone is connected to the PlayStation 3 through the USB port, while connection to the Xbox and Xbox 360 occur through the 2.5mm jack on the console's controller. The headset supports the chat function of both manufacturers. The microphone includes a mute switch and a separate volume control. For pleasurable wearing comfort and flexible handling you will find a padded, adjustable headband and ear cups, a detachable and flexible microphone, and a four meter long headset cable. Its black design with red accents gives the Sharkoon X-Tatic SR, in addition to everything else, an exciting look. The Sharkoon X-Tatic SR is available in North America on August 25th from the official Sharkoon retailer Amazon.com, and in Germany during the middle of September (CW 37). Those are cool looking headphones to say the least. I would like to sample them before buying.